It is terminal branch of the common carotid artery, it is larger than the other terminal branch (the external carotid artery). It is an important cause of ipsilateral stroke. The natural history of the disease is related t the presence or absence of ipsilateral hemispheric symptoms and the severity of stenosis. It is an important cause of cerebrovascular disease. 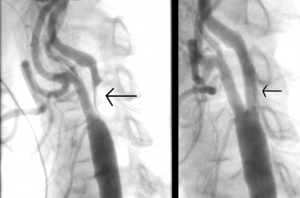 A nerve_symptomatic occlusion increases future risk of strokes. Ultrasonography, magnetic resonance imaging and contrast angiography are useful diagnostic tests and functional imaging of the brain helps to understand haemodynamic factors involved in the pathophysiology of brain ischaemia. ↑ BhomrajThanvi and Tom Robinson, complete occlusion of extracranial internal carotid artery: clinical features, pathophysiology, diagnosis and management, Postgrad Med J. 2007 Feb; 83(976): 95-99.